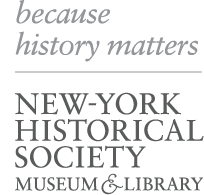 This project was funded by the Institute of Museum and Library Services and co-administered by N-YHS and NYU. It contains digital images of historical documents that preserve the words of hundreds of eyewitnesses to the American Revolution in and around New York City. This digital archive includes the collection of maps by George Washington's cartographers, Robert Erskine and Simeon DeWitt, the Alexander Family Papers, and all broadsides published from 1776 and 1783 in the N-YHS collections.